And here it is now, September. Just like that, we’ve entered the Ember Months, as I like to call them, for they all fall at the end of the year and they all have the same ending (–ember), save for October, of course, which has a variant of it, but still falls neatly into the Ember Months category. September, October, November, December: these are the months named for numbers: seven, eight, nine, ten… which described these months well before Julius Caesar added July and before Caesar Augustus added August to our calendar, both of them smack in the middle of things. And now they’re out of place a bit, these great months, the numbers that gave them their names out of sync with their calendrical places. It was in September that my grandparents, both sets of them in their own respective places, even before my parents met, made their wine. My father would describe cleaning out the barrels each year with chains, which sounds like a heavy job and certainly it was. As were all the tasks of winemaking. Dad thought he would make a clean break from winemaking by marrying my mother and moving in with her family. But of course they made wine, too, each September, and so his work continued. 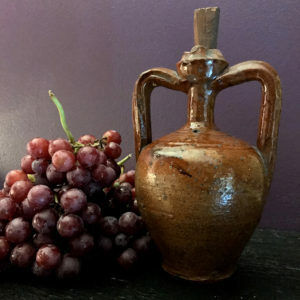 There was the washing of the barrels and there was the trip to the market to buy all those grapes––crates of them, Zinfandel being Grandpa DeLuca’s grape of choice. And then the washing and crushing and barreling, the prelude to the magic of fermentation. The first tasting would not come until St. Martin’s Day in November, but what a great and exciting day that would be each autumn. I never got to taste the wines that any of my grandparents made. By the time I was born, they were all buying their wine in bottles. 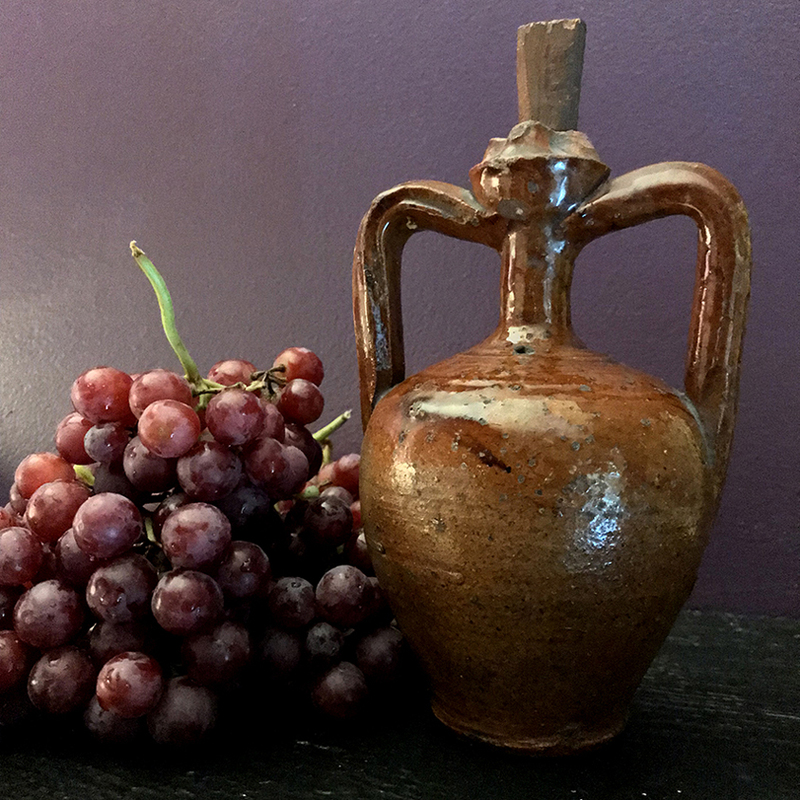 But there is one connexion to our vintner past still in the family home: a ceramic vessel from Lucera, our ancestral homeland in Puglia, that belonged to my great-grandfather, Raffaele DeLuca. Grandpa’s sister Adelina brought it from Italy and gave it to my grandfather, and there it is in the photo above. Perhaps someone else gave it to Raffaele, for on the wooden stopper are carved and inked the letters T’C, and there are no T’Cs in our ancestral lineage that I have found. Perhaps the letters refer to the potter who made the vessel. Perhaps we’ll never know. It is the oldest thing we have from our past, this vessel that we’re not even sure what to call. It seems particular to the region of Puglia, from which my grandparents hail. My mom and aunt both remember Grandpa calling it a biretta or a fiasca. Fiasca translates neatly to “flask,” but biretta is not an easy word to translate and probably was part of Grandpa’s Lucerine dialect. Oddly enough, biretta is also the name of the hat that is commonly worn by many clergy in the church, from priests to bishops and cardinals. You know it. It’s the square hat, black for priests, red for cardinals, with the four peaks or horns. If you look squarely down on the top of Raffaele DeLuca’s wine vessel, it, too, is shaped just like one of these hats. So maybe that’s where the name comes from. No one knows. But anyway, all of this is to say that Grandpa’s biretta reminds me always of wine and winemaking, and September reminds me of these things, too… and so perhaps it is only natural that that biretta is the cover star for your Convivio Book of Days calendar for September. The calendar is our monthly gift to you: a printable PDF on standard letter size paper that you can pin to your bulletin board. It’s a nice companion to the blog and with any luck, I’ll be writing about each of the days mentioned in the calendar. And if I don’t, know that I’d like to. It’s a busy time of year––and I’m not even making wine. You can find a handsome photograph of Raffaele & Maria DeLuca, my great-grandparents, at our About page. And finally, to send you off, here’s a home movie of winemaking at my grandparents’ home in Brooklyn in the late 1940s or early 1950s. Mom is probably filming the event. Dad is hammering a barrel at the start; Grandpa is holding a barrel hoop and turning it around. The neighbor, Mamam, initiates the Dance of the Pizza Pans with Grandma, who always seems to be saying, “Turn off the camera!” I love all these people. They are the reason behind the Convivio Book of Days. The passing of July when I was a kid was always met with a bit of melancholy. The beach days were numbered. The afternoons playing Italian card games with Grandpa, games like Scopa and Briscola, were numbered, too. Once August rolls around, summer is much changed, for it comes with the knowledge that school is going to start soon. Early on in our agrarian past we had a day to mark this change. It’s a day not much celebrated anymore, though it has value, for it marks the transition as summer begins to make its way toward autumn. It’s called Lammas in the English tradition, Lughnasadh (pronounced LOO-na-sa) in the Celtic tradition. It is the first of the harvest festivals, and we celebrate it with fresh baked bread from the first grain harvest of the year and we celebrate it, too, with spirits made from that grain. 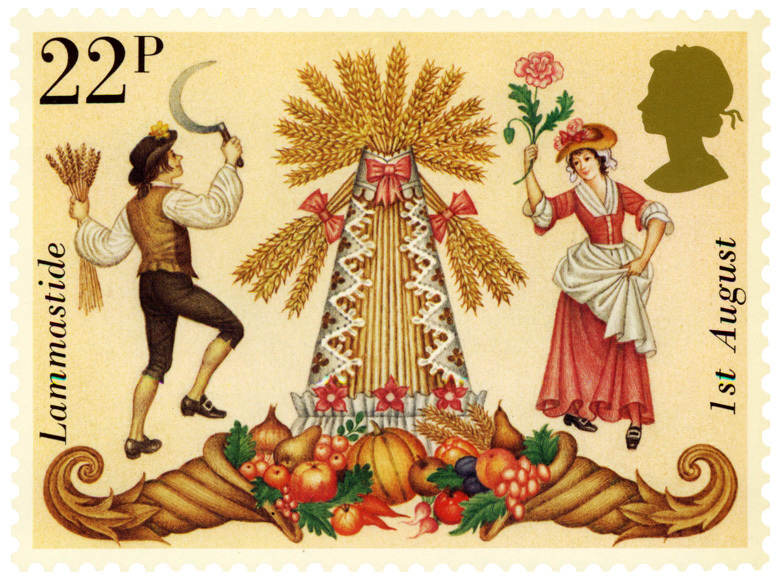 John Barleycorn is the personification of that grain; he is celebrated in poems and songs. Drinking songs, mostly, to go along with those spirits. Perhaps because it is such an agrarian holiday, this cross-quarter celebration has fallen out of favor more so than the others of its ilk. Cross-quarter means it marks a halfway point––in this case, the halfway point between summer solstice and autumnal equinox. By traditional reckoning of time, this is the start of autumn, even though the hottest days of summer are perhaps still ahead of us. Certainly that is the case here in Florida, we know this, but I have been in Maine at Lammastide, too, and noticed the sumac trees beginning to turn toward shades of red, as we approached there the time of Queen Ann’s Lace and Black Eyed Susans and soon, asters blooming purple––a sure harbinger of fall. And so we enter Lammastide, days marked well by a fresh baked crusty loaf and perhaps a pint of ale or a dram or two of whisky. Raise your glasses to each other and to me, if you will, and to old John Barleycorn, too. Summer is waning, autumn is coming, we are beginning to turn our thoughts toward gathering in. There is melancholy to that but warmth as well––warmth in that crusty bread, warmth in those spirits, too, and in the ones we gather to celebrate with. Happy Lammastide. Image: “Lammastide,” one of a series of British postage stamps issued in 1981 celebrating folk traditions. As for your Convivio Book of Days calendar for August, it’s going to be a bit belated. Look for it after this weekend!